Before you dismiss the debut novel of Jeremy Bushnell, who teaches writing at Northeastern, as another plodding entry in the publishing industry’s quest to put out what seems like every saga written about young Brooklyn literary types, read past the first chapter. Amid the bustle, the two pals chat quasi-sincerely about bananas and global commerce, conversational fare that firmly establishes them as among the underemployed, aimless, young-ish liberal-arts grads that populate so much contemporary fiction, especially first fiction for all the obvious reasons. Both Anil and Billy are aspiring fiction writers, barely getting by on wages from their day jobs at a sandwich shop. When Billy’s not slicing bread or going to parties in industrial spaces, he’s dithering about his girlfriend, an aspiring filmmaker named Denver. But in the second chapter, something mercifully unexpected happens: Billy wakes up with a terrible hangover and notices a man sitting on his sofa. The man introduces himself as Lucifer Morningstar — the devil himself. He is there in Brooklyn to strike a bargain and to save the novel from becoming just another one about the difficulties of white, middle-class existence. 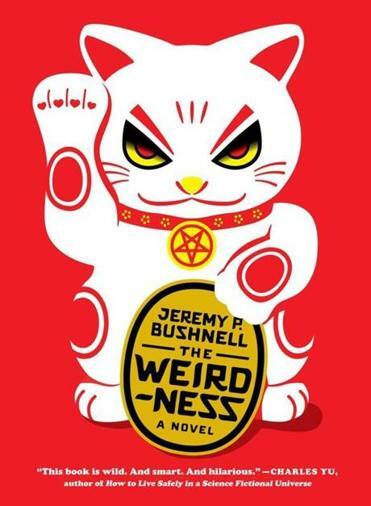 A powerful warlock has stolen the Neko of Infinite Equilibrium, a perpetual motion machine that resembles one of those waving cat statues found in Asian restaurants, but with the power to destroy the world. If Billy retrieves the Neko from the warlock’s lair — a scary tower in Chelsea concealed by a magic spell — Lucifer promises to use his industry contacts to score the unpublished writer a five-figure book deal. “A five-figure advance!” Billy thinks, realizing the devil may have promised him only $10,000. Still, the offer is tempting enough that further negotiations ensue, leading the young hipster on a madcap adventure involving mythic beasts, alternate planes of existence, and lousy fiction readings. “The Weirdness” isn’t a high-concept satire of the literary scene or a fable about the queasy intersection of artistic integrity and worldly success. It’s, well, weirder (and more entertaining) than that. What emerges instead is an utterly charming, silly, and heartily entertaining coming-of-age story about a man-boy who learns to believe in himself by reckoning with evil. Among the novel’s greatest strengths is Bushnell’s goofball sensibility — so many novels take themselves way too seriously. Bushnell’s readers may be pleasantly reminded of James Hynes’s “Kings of Infinite Space,” a terrific book about an English professor who fails to get tenure and winds up working for a fiendishly dull government agency staffed by demons. Bushnell, like Hynes, uses outlandish, supernatural horror to expose the everyday horrors that plague us all. When Billy enters his first evil paranormal domain, for instance, he finds himself in a Starbucks. It “looks exactly like every other Starbucks he’s ever seen: a counter with an aproned staff working behind it, busying themselves at various beverage-producing apparatuses” with “the same impulse items flanking the register” and “[s]oul music sung by a white British person” pumping on the stereo. But upon ordering an Americano, Billy discovers the baristas are magically enslaved, their forced cheer belying an unholy terror. Or consider the blood-curdling living conditions of middle-class young adults in the outer boroughs of New York City: Billy’s girlfriend shares a house with 11 other people and sleeps in a hammock in an attic room across from another person who sleeps in a hammock. Billy himself lives with a roommate in a tiny loft and sleeps above the kitchen in full sight of anyone who walks past. These crowded spaces make Hades itself seem like a welcome and capacious respite. Despite some pointed similarities to our workaday world, Billy’s saga is largely a fanciful one, and so provides a welcome antidote to heavy-handed millennial fiction. Instead of trying to find profundity in party conversation or making his readers shudder in melancholy recognition of their thwarted lives, “The Weirdness” finds virtue in absurdity. Thank goodness — or darkness — for that.